Cost of sales (COS) increased by 9% for the period to US$3.25 million (2017: US$2.99 million). As a result gross profit increased year-on-year for the nine month period by 7%, from US$8.28 million in 2018 to US$8.86 million in 2018. Gross profit for the third quarter improved from US$3.25 million in 2018 to US$3.61 million, a 11% increase year over year. Total expenses increased by 10% for the period in review to US$6.04 million for 2017, up from US$5.48 million booked for the nine months ended February 2018. The increase was associated with a 11% growth in administrative expenses to US$5.59 million from US$5.05 million. Depreciation and Amortization saw a 4% increase to US$415,946 compared to US$400,475 for the comparable period in 2017. Promotional expenses saw a 19% increase from US$30,380 to US$36,108. Total expenses for the quarter increased 20% to close at US$2.40 million (2017: $2.00 million). Consequently, operating profit for the period inched up by 1% to US$2.81 million (2017: US$2.80 million). However, operating profit for the quarter totalled US$1.21 million, which dipped by 3% relative to US$1.25 million booked for the corresponding quarter of 2017. Finance cost of US$259,075 (2017: US$287,178) was incurred for the period, while foreign exchange losses amounted to US$8,463 (2017: FX losses:US$10,986). Consequently, profit for the period amounted to US$2.55 million, a 1% increase above the US$2.52 million recorded for the corresponding period in the prior year. For the quarter, profits amounted to US$1.13 million versus US$1.14 million booked for the comparable period in 2017, a 1% decrease. Earnings per share (EPS) for the nine months totaled US$0.16 cents (2017: US$0.15 cents). Earnings per share for the quarter amounted to US0.069 cents (2017: US0.069 cents).The trailing EPS amounted to US0.21 cents. The number of shares used in the calculation was 1,637,500,000 units. 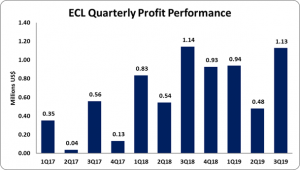 Notably, ECL’s stock price closed the trading period on April 10, 2019 at a price of JMD$7.51. The company, as at February 28, 2019, recorded total assets of US$7.04 million. Notably, ‘Owing by related companies’ as at February 28, 2019 amounted to 119,594, while ‘Trade and other receivables’ totalled US$960,942. ECL highlighted, “Fixed Assets expenditure during the Quarter was US$170,288. This resulted in a combined 9 months expenditure of US$304,613, the major share of which was spent to complete the work on the additional Starbucks locations in the Airport, major upgrade to the Exhaust system in the main kitchen as well as the other necessary upgrading work throughout the existing facilities. Increase in Trade and Other Receivables is temporary and is expected to be returned to prior fiscal year end levels. The balance owing by related parties was paid down by a further US$ 93 thousand during the Quarter for a combined 9 months’ pay down of US$5.88 million. Income tax payable was settled just after the close of the Quarter and in line with statutory payment deadlines. Total Stockholders’ equity as at February 28, 2019, closed at US$2.03 million; this resulted in a book value of US$0.12 cents (2018: US$0.34).